The fans of TVXQ’s U-Know Yunho have prepared a meaningful gift for U-Know Yunho to celebrate his birthday and TVXQ’s 10th anniversary. The fans’ ad can be seen on Line 3 of Seoul’s subway system. The poster in the advertisement includes a picture of Jung Yunho’s face and a celebratory message of support for the singer. TVXQ celebrate their 10th anniversary on the 26th of December last year, and U-Know Yunho will be celebrating his birthday on the 6th of February. 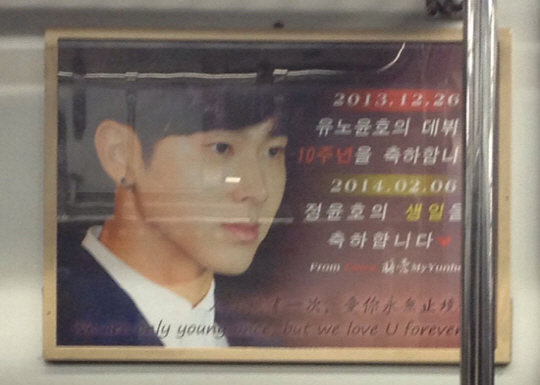 To commemorate these two events, Jung Yunho’s fans came together to create an advertisement. Meanwhile, TVXQ are currently busy promoting ‘Something’, the title track of their new album.